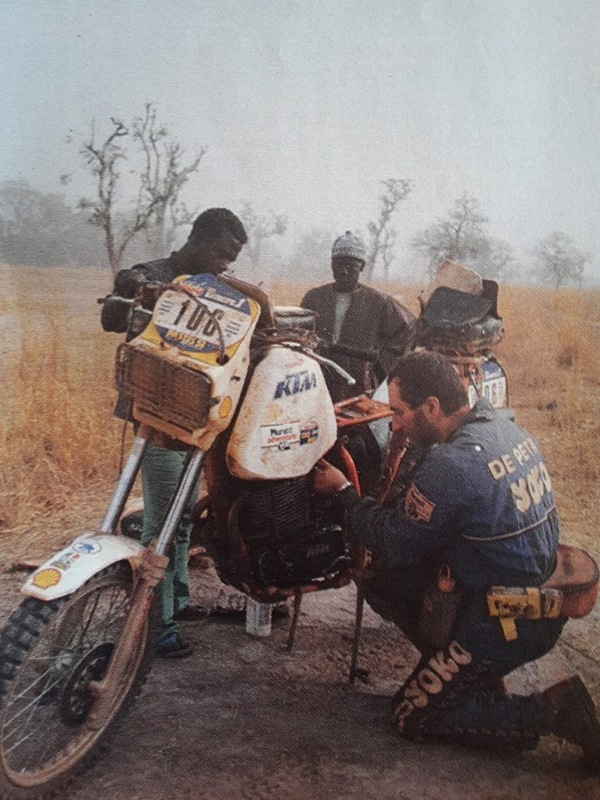 The long March of Nani Roma towards the final victory in the African race harder, a life to Dakar. It's past midnight somewhere now. The whole world wakes up at lunchtime after having drank and danced to celebrate the start of the 1996. 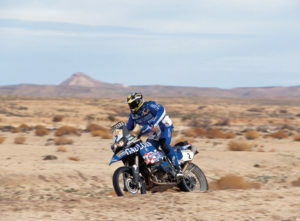 Juan Roma Cararach wakes up in the head to Dakar. Behind him all the Giants: Peterhansel, Orioli, The strip contains, Kinigardner. That afternoon of new year's day while he builds the tent, at Oudja in Morocco, the light in his eyes is really special. 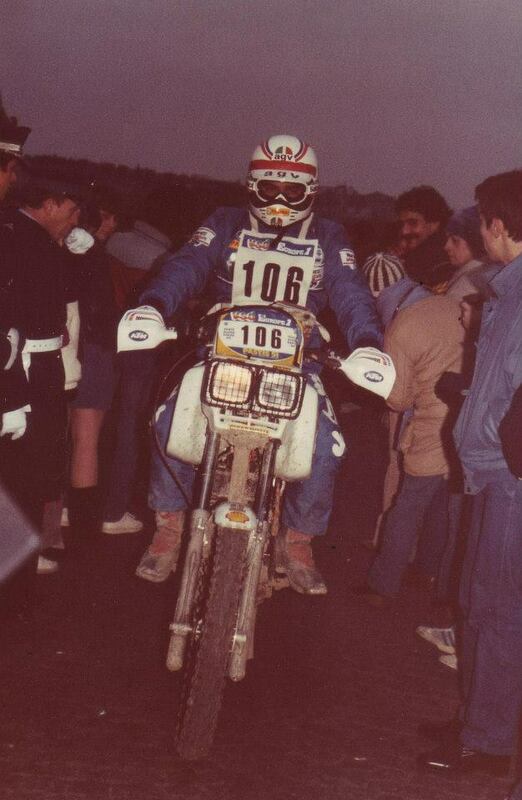 "It was my first Dakar, everything looked easy "
That year the race started from Granada. 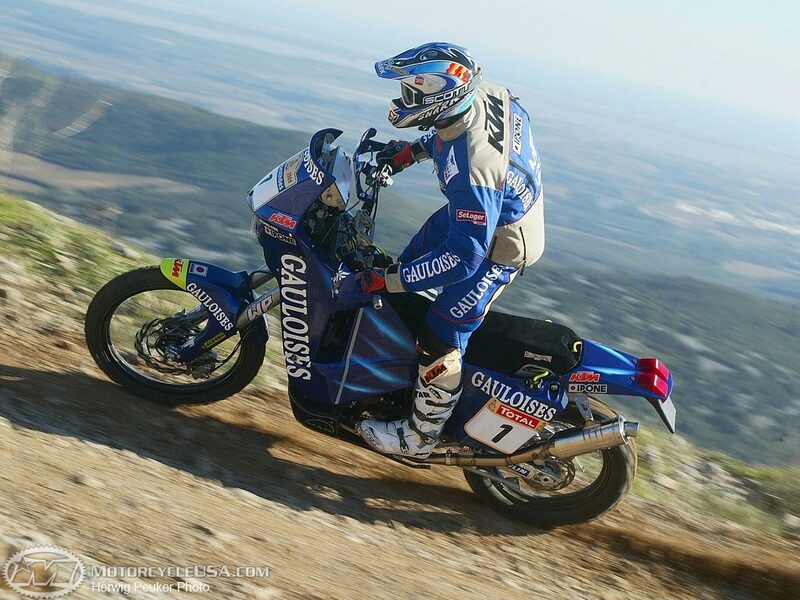 The first stage up to Malaga win Tiainen but he is there that if the play on par with the Finnish and Trolli on land impossible, extreme enduro. The second in Morocco from Nador to Oudja wins Kini but he is always there. 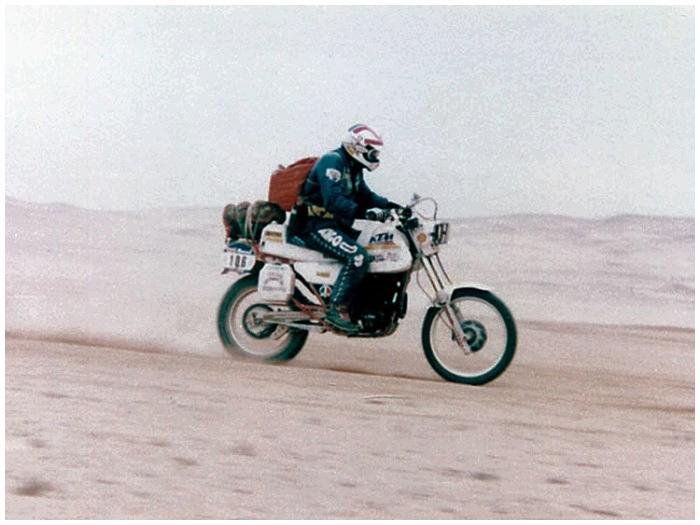 On gravel bars Yamaha 650 twin Moroccan Peterhansel struggles, Rome does not pray, for a moment the tremble wrists, then open up the gas and gets behind the Dragon whose only pronounce the name put AWE. Rome is in the lead in the overall standings after 463 kilometers, in the next stage to Er Rachidia (552 kilometers of which 328 Special) take the wheel of Peterhansel and not the spring. Where is driven Midgets preempts, on the fast passes and filling it with dust and stones, to make them understand that this is the game of the great, you swim in the sea up and is the shark that makes the rules. Missing 6564 kilometers in Dakar but newspapers and televisions around the world do not speak of him, is the new man though it is a bit early to say. The guy is very cute and it's beautiful to see the Guide, his technique enchants and many are convinced he can win soon, Maybe now. 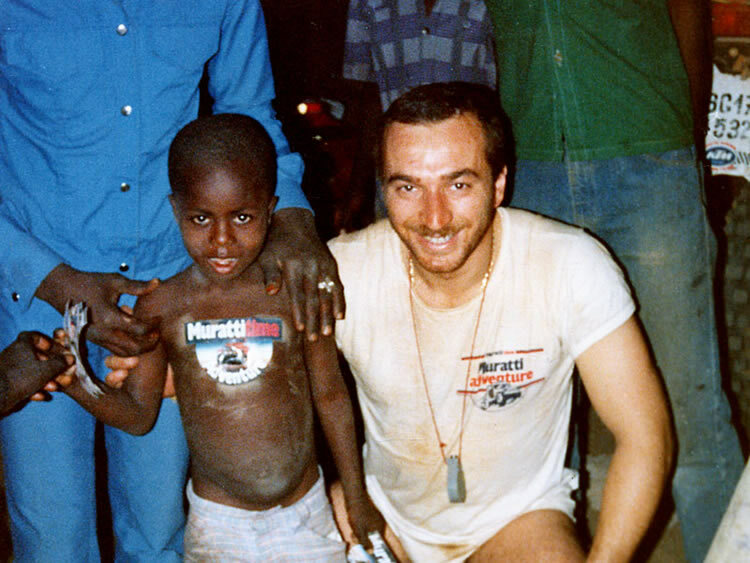 Said the great Fabrizio: "I love Midgets, from him I learned a lot, It has a refined technique, his body on the bike is always in the correct position "
The year after it starts and arrives in Dakar. The path is hard, tiring right away, Nani is there but at halfway point, to Agadez in Niger, falls and breaks the scapula and clavicle. When medics, the trucks on the ground but his bike there is, someone stole it. Will be found again seven years later, in the middle of 2005. Africa takes and gives according to logic sometimes garbled. Now he's in his garage in Folgueroles where Nani is born and lives. In 1998 going strong and is strong also in navigation. The fourth stage El Rachidia-Ouarzazate, he stops and looks into the ground. His head tells him right, the traces of others say straight. What to do? "I was sure it was right, but might they mistook the strip contains all, Peterhansel? 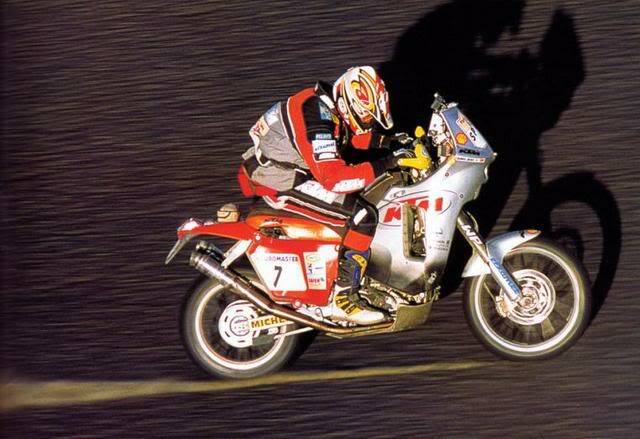 Then came Fabrizio, as always, solid as a rock, He nodded his head, cut off the clutch and vanished into thin air ... obviously right. I didn't need more confirmation, Fabrizio was enough. The I went back, We went strong as ever, We danced to hand in a fandango wonderful. Around us silence, behind us. " 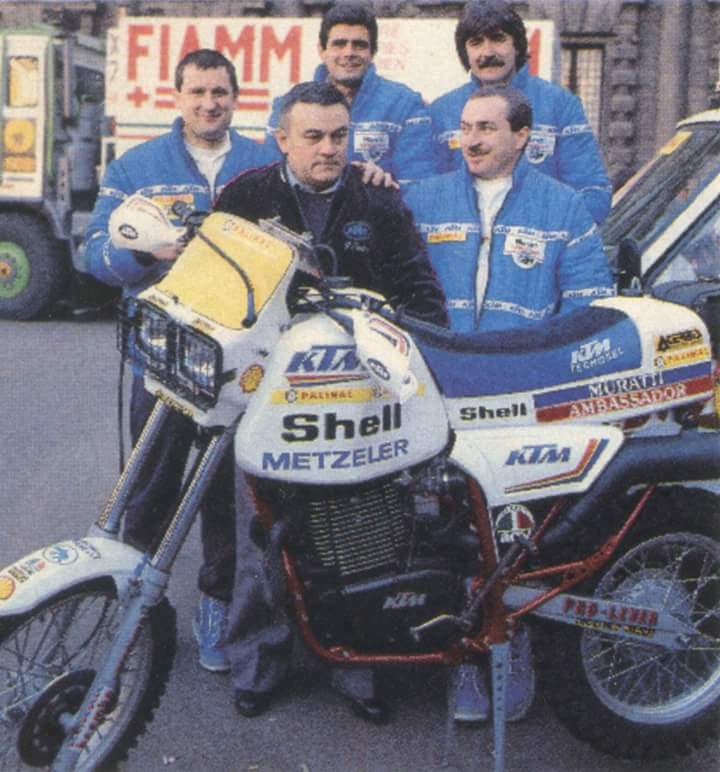 When they arrive at the bivouac descend from motorcycles to wait for the others. The first came after half an hour. Meoni wins the stage, the two are in front of a lifetime. Nani would administer the advantage but the sixth stage (Smara Zouerate 614 kilometers, 494 Special) It is a fast track, very fast, Peterhansel passes on the obverse. 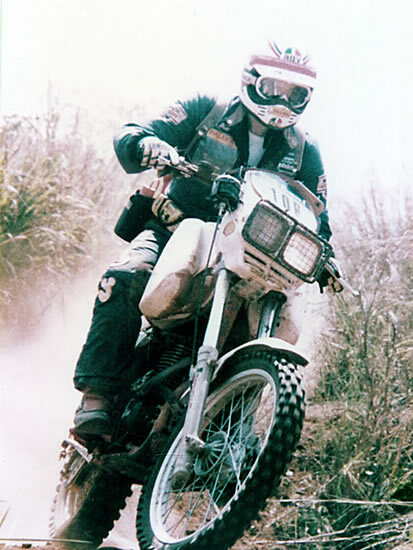 “I felt like I was still, that twin cylinder Yamaha went that was scary. Stephan had fire inside, took me 18 minutes alone in that stage ". 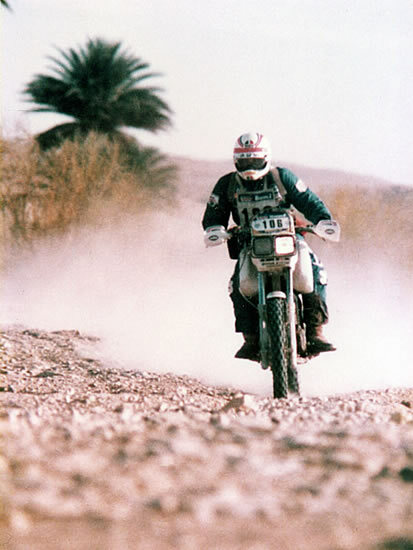 The next day leave towards El Mreiti, There had been problems with the assistance and the bike was not perfect, at mid-term breaks a clutch bearing. The bike is stationary, Dwarfs the sits next and look forward to the assistance. The wait lasts all night. "It was an unforgettable experience, the sky lit up from the stars ". If she could hear the music, He would have turned up the volume to a Springsteen ballad, Instead you stay there listening to the sound of the desert, absolute silence. Nani is firm but grows more and more everyday, He knows he's strong and maybe one day triumph. "Winning is always hard, win one ". For now it's OK and KTM proposes a contract for the following year. 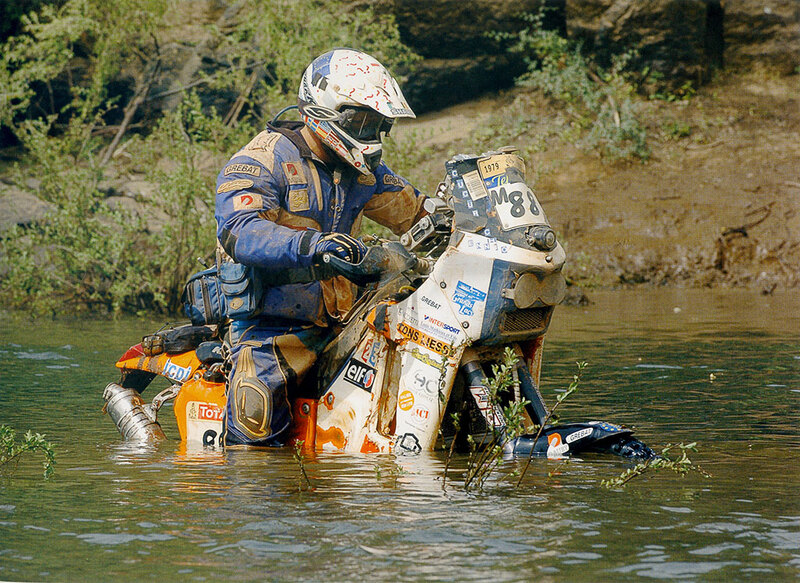 Can choose to take just the Dakar and earn about 30 million pounds by then, or do all the races and earn less than ten. "Obviously I choose to run more races as possible"
In 1999 There is no head, It is separated from his wife, with whom he had a daughter two years earlier and is not focused on the race and yet it goes fast. 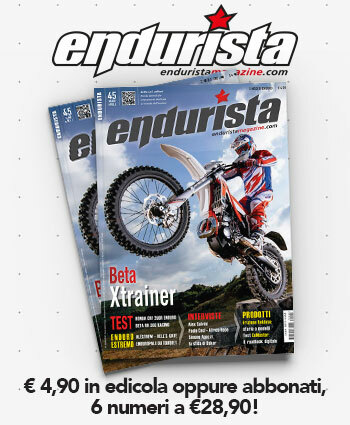 The KTM entrusts Giò Hall as gregarious. "It seemed impossible that Gio was there for me. Is someone out of the ordinary, a good man, loyal, I have always enjoyed being with him. Sometimes it was stronger than me and would stop at special waiting for me, I was embarrassed, It didn't seem logical ". It is in the form, going strong but also falls in ' 99 ... and make four! He had stopped to see what pit stop on the track to success Meoni, sharing, in 20 per hour takes a stone and Earth. Back in motion, He hurt a finger but ends the same special (Bir Mogrein-Atar 629 Km). The doctor who visit upon arrival prevents him from starting the next day: that finger is fractured into eight parts. In 2000 It starts from Dakar and arrive in Cairo. KTM (who hasn't ever won) deploy an army of motorcycles and the challenge is with BMW which won the previous year with Sainct. Nani is the fastest, is impregnable to all. The second stage is leading the General. Starts first and nobody can even approach him. He won the third and fourth stage. At Bobo Dioulasso has a leg up on Sainct of more than 20 minutes. The race is tough, Kappa pilots leave one behind the other. He knew how to do, administers where is risky, It makes a difference where I feel I can do. Nani is there and it's scary, every morning part and disappear into thin air, is focused, motivated. As much as others seek solutions, every day the delay from Rome increases. 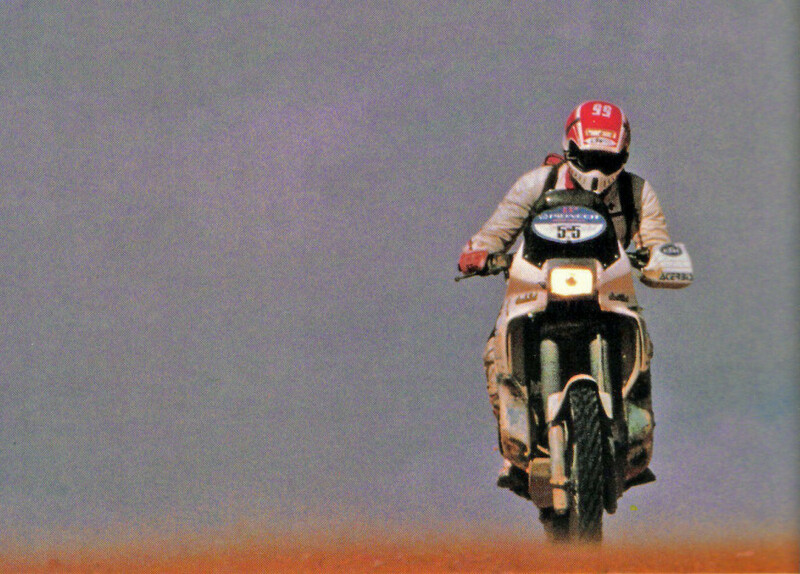 The ninth stage from Waha to Khofra in Libya, Sainct sticks to death but takes it one second in 610 mileage special. The tenth stage door in Egypt, where the finish line is expected in Cairo three days later. Nani just go, take the wheel of Sainct and receive assistance until the end. It's done, No one will take the success. 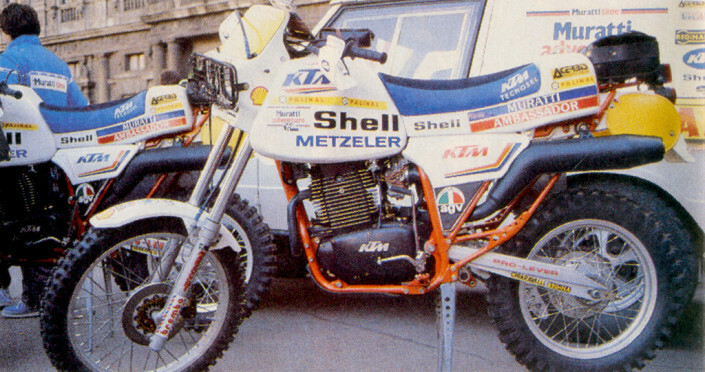 "There was great confusion to KTM, were mounted pieces never experienced before, the mechanical problems were commonplace due to reckless and illogical by technicians, the bikes suffered substantial changes without the certainty of success. I was leading you, but alone ". The tenth stage his engine breaks, the bike sinks into the sand and with her dreams, the hopes, the job done, the talent that perhaps no one will recognize. More than music, nothing but silence. Nani takes his head in his hands, everything around him is stopped, the only thing that moves is the BMW of Richard Sainct serena advances to the final victory. Nani is no longer the rookie of the ' 96, It's a fast driver, is a sample in which the bad fate took away the World Cup winner. That anger, How sad. The passing time lasts a lifetime, When unable to restart behind create a vacuum, He won the last two stages. 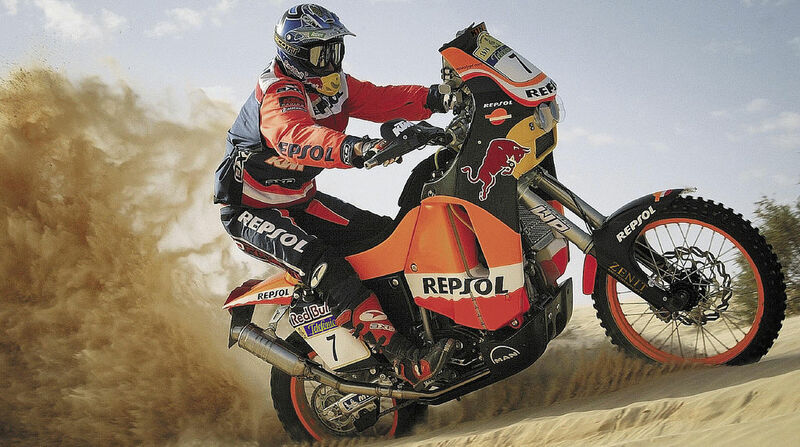 He, who is the winner of the Dakar rally of the year 2000, of will just 17th. BMW square four motorcycle to the first four places in the year which was supposed to be by KTM. Nani's pandemonium, in Munich they want. BMW offers him money and a twin for two years. “I told you, I wanted to change. The twin cylinder motorcycle was harder than I'd ever driven but was a challenge, I wanted to try "
The prologue of the 23rd edition, does the absolute equal time with friend Hall. "Make time in a special led by six minutes with that bike was simply hilarious, It was difficult, It was heavy, bulky " With that bike was hard to imagine the final victory, but he is trying, He won a few stages before retiring for a fall where you break a knee. Wins the KTM, WINS an uncontrollable Mahmoodi. "BMW decided to retire a year early. I was without motion and jobless. I Called Kini, did not leave me not even finish speaking: KTM is your home, You can go whenever you want, for you a motorcycle there will always be ". In 2002 in the race there are two people. Nani Roma, the talent and Fabrizio Meoni the giant. Fabrizio has built a motorcycle pants. 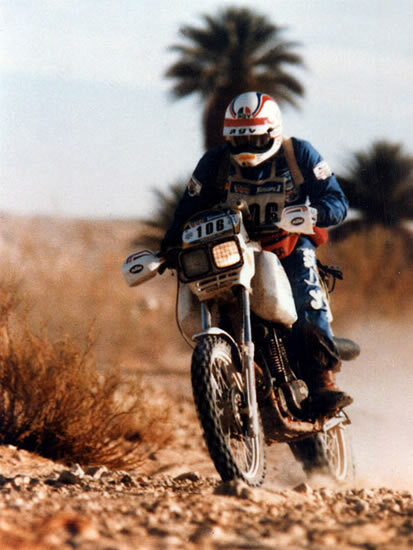 At the end of the summer had turned up at the Rally of Egypt with the all-new twin-cylinder LC8. At that rally has left Rome in the lead for almost the entire race and then go after it to get at the end and put it behind. Fabrizio is in a State of grace, does what he wants and doesn't seem to have weaknesses, to beat it it takes concentration, speed, tactics. From the fourth to the seventh stage Nani is leading the General, at Zouerate in the eighth, Meoni takes the lead. Nani starts his pursuit: the twelfth the two are in close proximity and with minimum detachment reaching Tichit in Mauritania. 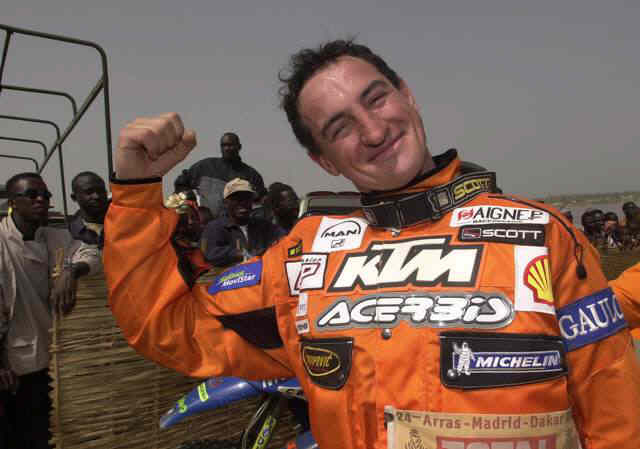 Missing two decisive stages for the final victory of the Dakar 2002. And this is where amazing happens. A helicopter of the French television, follows the whole sequence, the cameras follow the efforts of animal crazy. The aircraft remains on the scene, It cannot relinquish himself. And try, try, and try again. The mountain is bigger than him but Nani continues, coughing up blood, trying to climb over. Then drops to the bottom of the Valley, Slow down, is sitting, the bike stutters and is out of control, He walks with difficulty because it is unmanned, Nani is clinging to the handlebars but semi-passed out. The bike moves forward slowly to inertial force, then bends to the ground with his helpless pilot. The helicopter comes to rest at his side. Nani trembles, She's cold, is terrified. "You didn't hurt", the surrurra inside the helmet Gerard Roltz, France Television journalist. No, you haven't done nothin', fell from a standstill. But inside you that bad: "stupid! It was enough to make half a turn, Instead I tried to climb Everest!”. The Grand Champion, hope that seven years earlier had caused to be written by himself, is once again on her knees. 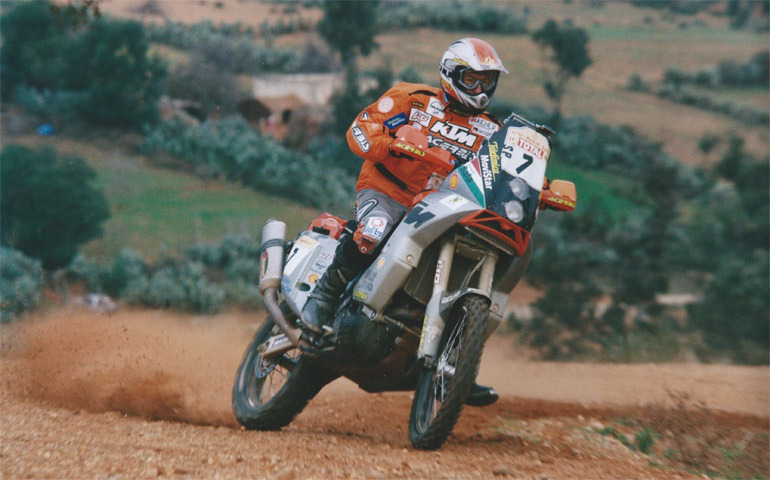 "LC8 was my bike, I liked most of all, KTM decided to give it to me after the Dakar, I was very glad, I won right away in Tunisia ". After many placings, many falls, such bad luck, a victory there wanted, Yet many observers swear that Juan Roma Cararach never won. 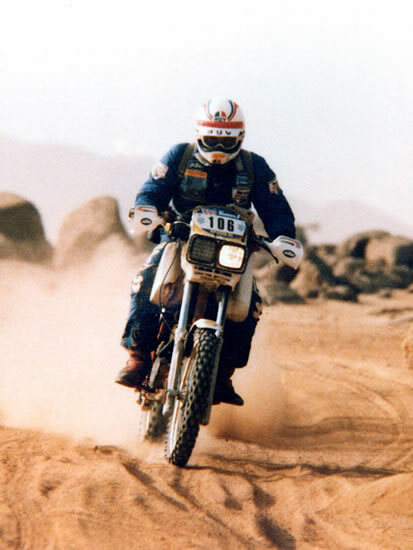 When could he didn't for misfortune and falls, now joined in a negative loop and won't win more, sentences someone else after the fall in 130 hours in the middle of the stones off the track on his way to Zilla (Libya) the Dakar 2003 where it leaves the skin. Who is Rome? You can be King without a Crown? You can be among the greats never won? The measure itself is given by what everyone feels, the appreciation of others that never missed. Everyone has always had great admiration and respect for him and that could be enough to put his name on the Bulletin Board of the great, or maybe not. 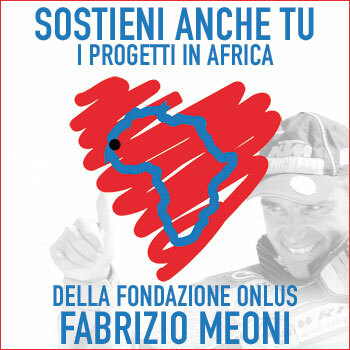 "I always going for myself, I was never interested glory, I always gave everything I could, in Africa the races are difficult, the wind whirls in a moment and what looks like easy becomes impossible ". 1 January 2004, France, the 26th Edition of the Dakar rally. The bikes are underway 195, the number 4 is its. The prologue in the snow who, of 35 thousand spectators, is willing to bet a penny on him? There are things to do 9506 mileage and 500 meters, centimeter after centimeter, meter by meter. Minutes, hours, days. Fast opponents, of experience, Smart. He doesn't know, Yet this is the right time. Will win and be King among Kings. Esteve Pujol is leading the fifth stage, at Tan Tan in Morocco Dwarfs supports in General. In 1055 kilometers of next stop Esteve Pujol falls, Mahmoodi has problems with his LC8, Sainct going strong and reduces the disadvantage by winning the Special. Nani wins the day after. Despres pushes but not scary because it has a delay to the eighth stage. Then the airlift, There are safety issues in Burkina Faso and competitors are directly at the departure of airborne 12 stage. Dwarves deep breaths, keeps his cool and his head so still in the next step. In the 14th stage from Ayoun el Atrous to Tidjikja, Nani is lost but this time finds his way, throw out just over a minute but remains front while Despres continues to win and to approach the podium. Midgets are shaking their wrists and in 15th stage, won by Mahroof 2.37 "loses on Sainct chasing him, other 2 minutes in the 16th but that's OK. Loses every day seconds, minutes and earn every day, cm, meters, kilometers. 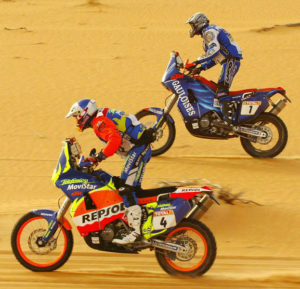 The 17th stage was Dakar-Dakar 106 kilometers of which only 27 Special. WINS again Despres, Nani caresses the shoreline of the Lake Rose with a little gas, running free, clear to its Crown of Kings. Who is Juan Roma Cararach, a month before, a sample, but now in his head the Crown that for too many years has been hidden somewhere in the sand. This is the end of a story that starts half an hour after the award ceremony in the lobby of the hotel Meridien in Dakar. Nani signing for Mitsubishi and starts a new career on four wheels. 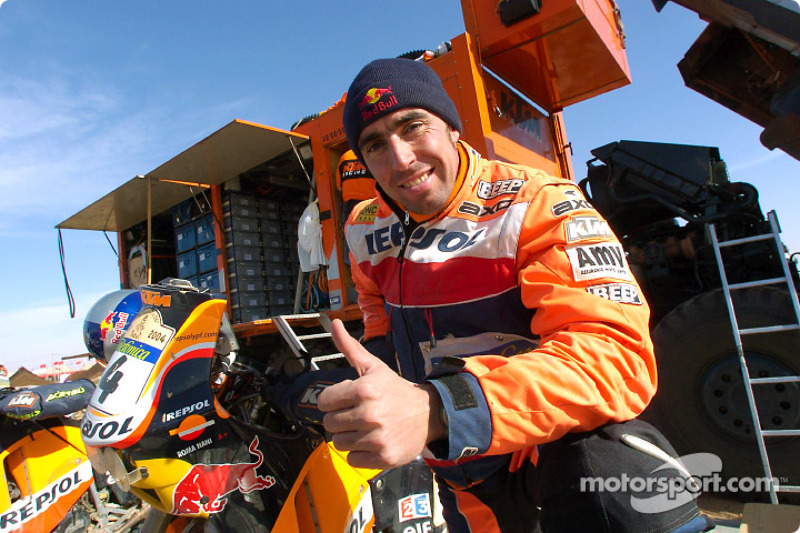 "I'm very fond of cars, I had the money I would have started racing in the car right away "
3º FIM Cup Rallys t. T.